Our Operations are primarily focused in the West Texas area of the Permian Basin. 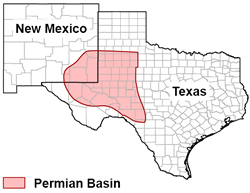 The Permian Basin is one of the most prolific producing oil and gas regions in the United States. The extent of this Basin covers a width of 250 miles and is 300 miles long. Production in this area occurs in multiple horizons ranging from as shallow as 1,000 feet to over 26,000 feet and is characterized by long life and low decline reserves. By concentrating in one Basin, we are able to develop expertise in drilling and completion techniques that minimize costs while maximizing production. As a result of our engineering and geological expertise, we are able to generate most of our prospects internally. Utilizing the latest in 3D Seismic, horizontal and directional drilling techniques and hydraulic fracturing, we can successfully recover additional reserves of oil and gas from this mature Basin. Incline Energy has drilled wells to depths of over 10,000 feet but we prefer to focus on projects the the 3,000 to 7,000 foot range. We currently operate approximately 150 wells and have interest in an additional 40 non-operated wells. Even though we generate the bulk of our prospects internally, we are open to reviewing prospects to operate or participate in as long as they fall within our area of interest.